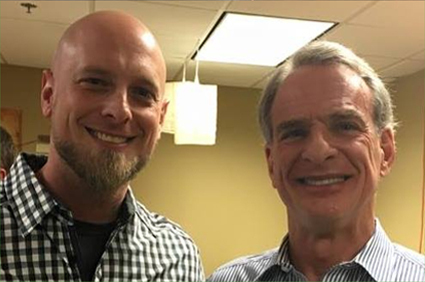 Dr. William Lane Craig, in my humble opinion, is the smartest man on the face of the earth! He is the finest of logicians, his philosophy of science is unmatched, and there is no better systematic theologian. On top of that, I recently attended his lecture at the EPS conference in Atlanta where he systematically refuted Stephen Hawking’s cosmological model (let that sink in for a while). Dr. Craig is so scary smart that the popular atheist, Sam Harris, states that Craig puts the “fear of God into many of his fellow atheists!” This fear is obvious as Richard Dawkins is scared to debate him and Neil deGrasse Tyson seems to have backed out from a debate with Craig. I have learned more from Dr. Craig than any other person on the planet; be that as it may, today I make a case that he gets one thing wrong. This relatively minor disagreement is regarding a hypothetical theory of time that we both agree is false. In a sense, this is quite humorous as we both hold to the same “A-theory” of time, but we disagree on one of the implications that would follow IF the “B-theory” of time were true. That is to say, we both think the B-theory is false, yet we disagree on the implications of the B-theory. Making a public proclamation that I believe Dr. Craig is mistaken is an uncomfortable place to be as I have come to see that whenever anyone disagrees with Dr. Craig, they are usually wrong! However, if one is truly committed to truth, one never needs to have fear because there is nothing wrong with being corrected and changing one’s mind to correspond to reality (or in this case, how reality would be if the B-theory were true). Since I desire truth, if I am wrong, I want to be corrected! If I am right, then we have a powerful defeater against what seems to be the number one objection on the internet against the Kalam Cosmological Argument (KCA). If my case passes, then atheists affirming the B-theory of time to avoid the theistic implications of the Kalam will have to also affirm that rationality and knowledge are untenable on the static theory of time. Thus, atheists will have to admit that they do not know anything and that would include knowing that the A-theory is false! My argument with Dr. Craig on this peripheral issue is important because it is both related to his KCA and to my Freethinking Argument Against Naturalism. If any aspiring apologist is going to share the KCA, they must be prepared to counter the bad objections that are raised against it. There are many problems with the B-theory of time; however, if my argument passes, I believe my objection is the strongest and the easiest to comprehend. This is why I choose to argue with the one person whom I respect more than any other academic. My disagreement with you is regarding the claim that if the B-theory of time is true, then causal determinism is NOT false. That is to say, if the B-theory is reality, then causal determinism is true. In fact, just as the shape and structure of a slide at the water park determines the movement of the person traveling down the slide, the shape and structure of the 4-D block of spacetime causally determines the beliefs and behaviors of the “illusion of self-consciousness” traveling down the frozen “worm” in the static block. My argument is that these “choices” are purely illusory on a naturalistic B-theory model. Dr. Craig, you rightly bring up the issue of divine foreknowledge and future free choices; however, I think this analogy is dissimilar. As you have taught me, knowledge (possessed by God or not) does not stand in causal relation with anything. For example, an infallible weather barometer that knew with 100 percent certainty that it will rain in Spain tomorrow does not cause the rain in Spain tomorrow. However, on the B-theory model, the shape and structure of the eternal and static block does causally determine the beliefs and behaviors of the “person” who is nothing more than a slice of a frozen worm in the static block. Consider my water park analogy again: if the shape of the slide veers to the left, you could not go to the right even if you wanted to. Similarly, if the frozen worm in the static block veers to the left, the illusion of self-consciousness goes to the left no matter what. Therefore, this “choice” is nothing but an illusion if the B-theory of time is true (this would include the so-called “choice” to believe the B-theory is true). If the eternal block of 4-D spacetime is reality, then not only does evolution not account for the biological complexity of primates “today” (complex primates are just as eternal as the eternal block), but the “choices” one makes have not *really* been based on deliberation and the process of reason. In fact, the so-called “choice” the slice of a worm has made has been frozen and static from eternity past and is just as old or ageless and eternal as the static block of 4-D spacetime itself. Moreover, on eternal and static B-theory, so-called indeterminate events like particle decay – while not determined due to antecedent causal motion – are in fact nevertheless causally determined due to their indelible eternal inevitability built into the time-slice strata of the B-block. It seems to me that these “indeterminate events” don’t really “happen” on eternalism; rather, the event is just as eternal as the eternal block itself. Dr. Craig, you are my hero and if it were not for your teachings regarding time theory, I would not disagree with you on this point. However, perhaps we don’t really disagree after all because you did say, “So long as causal determinism is false…” My contention is simply that if a naturalistic B-theory model of time is true, then so is causal determinism. I am looking forward to seeing you at the EPS conference in a few days! In between sending this question to Dr. Craig and his response at reasonablefaith.org, we had a brief exchange at the EPS conference regarding this topic. Not surprisingly, neither of us budged! However, this sparked a lot of interest and many fellow philosophers in the room wanted to study this topic further. A few days later Dr. Craig let me know that he was going to respond to my question on his website. I encourage you to read Dr. Craig’s uninterrupted response to my question here. If eternalism is true and the block universe exists exactly as it exists without beginning and dynamic time does not exist, inside or outside of the block, how can anything happen or change the structure of the block (including the fixed worms in the block). If the structure or shape of these worms changes, then we are no longer talking about static time and we have a paradoxical hybrid. I have previously argued that if dynamic time exists at all — anywhere — then God exists. My contention is that *free* choices do not exist at all when eternalism is conjoined with static time. 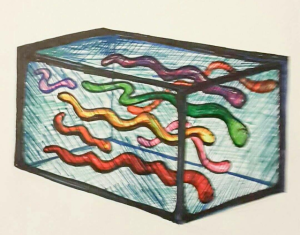 These fixed worms in a frozen aquarium have existed without beginning and nothing can happen to them unless dynamic time is incorporated. If that happens, the B-theory is over and we are on to something new. I disagree because as Dr. Craig has taught me, knowledge does not stand in causal relation with actions occurring in dynamic time. However, an eternal and static block/worm does not allow for *actions* at all (including making choices). Nothing is really moving or happening if time is truly static. I believe this is irrelevant to my case. I am not arguing for the necessity of antecedent events, but rather, the eternal and static position the block just exists in. That is to say, on static time, events do not occur at all! The physical structure would be the cause of the illusion of events that we experience (the cause is the physical, eternal, and static structure of the block; the effect is our illusion of dynamic time and choices that are not really occurring). How would this be possible on static eternalism? 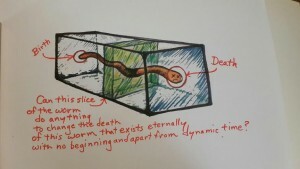 If the end of a worm is fixed and frozen in place in the physical structure of the block, how can one (a slice of the frozen worm) choose otherwise? How can one choose to turn right if the static and frozen worm eternally goes to the left and dynamic time does not exist? There is no ability to do otherwise, and in Dr. Craig’s response to my previous question on 6-15-14, he affirmed: “On the B-Theory of time there really is no intrinsic change. Indeed, nothing actually endures from one moment of time to another. There are just different slices of things at different times. So on the B-Theory, I am literally not the same person who was here a second ago talking to you. That is literally a different person. I am a different object than that three dimensional slice that existed a second ago.” Yet for a genuinely free choice, deliberation and selection are required. These actions are not instantaneous, and therefore involve different “slices” of the B-block. Since there is not continuity of identity over time, how can we grant libertarian free will (to which slice, and why that one rather than another)? Moreover, since change is merely an illusion of subjective consciousness on B-theory, these “slices” (even viewed collectively) are not even truly causing any change. 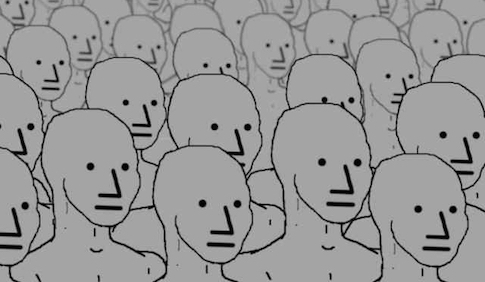 They are simply experiencing the illusion of change, as their so-called choices were indelibly fixed in the B-block logically prior to their birth. Perhaps Dr. Craig might be concerned that granting my argument will leave Molinism open for attack. However, I believe there is a major difference when it comes to Molinism. God created a world in which he knew how we will freely choose. However, since knowledge does not stand in causal relation, there are no causal strings attached. We have a genuine ability to choose otherwise. God simply just knows how we will freely choose. This is a major difference when it comes to the eternal static block theory. On a Molinistic A-theory humans have a logical ability to do things and do otherwise; on the eternal static B-theory, we do not. This seems to directly contradict Dr. Craig’s own words from 6-15-14: “… on the B-Theory, temporal becoming is a subjective illusion of human consciousness. In fact, everything in time, whether past, present, or future, are equally real. They all exist equally. The difference between past, present, and future is just an illusion of human consciousness. So on the B-Theory of time we are all subject to a tremendous delusion in thinking that things actually come to be and pass away and come to exist and go out of existence. In fact, they really do not.” If time is genuinely static then things do not happen or change. Choices (genuine choices) are things that persons do. Choices instigate change. If persons can determine and change the structure of the block, then we are no longer discussing static time. Moreover, Dr. Craig has noted, personal identity on the B-theory is problematic. If there are no persisting persons over B-theory time, then there are no persisting persons engaging in the process of reason and deliberation to make a choice. Again, if personal identity over time is impossible on the B-theory, then how would any “person” really determine or choose anything? It does not seem like any genuine “I” exists on the B-theory (at least from one slice to the next). Moreover, If the eternal block is static then things are not moving, changing, or happening. Therefore, genuine decisions are not being made. The “abrupt end” of one worm exists timelessly and a different static slice of that worm cannot act in any manner or make a genuine choice to do otherwise. 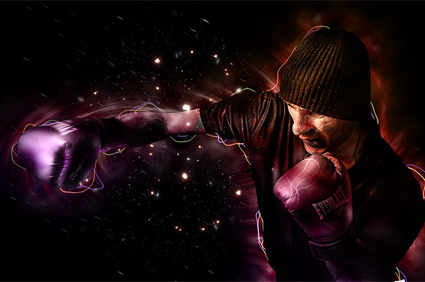 If it can, then we have now incorporated dynamic A-theory in the mix. To be clear, in my original question to Dr. Craig, I specifically stated in the last sentence of the third paragraph that “my argument is that these ‘choices’ are purely illusory on a naturalistic B-theory model.” Thus, on naturalism, all intentional states of self-consciousness would be nothing more than this causally effete epiphenomenon riding along the eternal and static physical structure. Therefore, for a naturalist hoping to escape the theological implications of the Kalam by affirming eternalism, they will wind up denying libertarian free will, and therefore, reject rationality and knowledge altogether. Unless I have misunderstood him, it seems that Dr. Craig has affirmed using my case in this manner against arguments assuming atheistic naturalism. This is vital, and the main purpose I had in mind, as this argument developed while in debate with naturalists trying to escape the theistic implications of the Kalam by appealing to eternalism and static B-theory. The naturalist who appeals to the B-theory in an attempt to escape the supernatural implications of the Kalam cannot appeal to a supernatural model of the B-theory. I must reiterate that this is really the crucial point as I offer this objection against naturalists who posit the B-theory to argue against the Kalam. So it seems Dr. Craig and I agree on the main point. However, with that said, I am not convinced that incorporating substance dualism into the eternal and static block allows libertarian freedom into the mix. I agree that B-theory makes a little more sense if God and soul exist, as God could create the static block fully formed (all at once) and substance dualism would explain intentional states of consciousness, but I still do not think it would allow for libertarian free will in the sense that there is no freedom or ability to do otherwise. If things exist as they do without beginning and things do not happen or change apart from dynamic time, then our souls are nothing more than an immaterial substance traveling down a fixed and frozen physical structure. Sure, now we have dynamic time in the spiritual realm (a soul is “moving”), but if spacetime is static, it does not move or change. I do not think this is a different problem. If personal identity does not persist on the block theory, then who is making a free choice to do anything? If the slice of a worm deliberating is a different slice of the worm concluding, and then a different slice is acting, there does not appear to be a genuine ability for a person to engage in this process “over time” to choose to act. On the perdurantist view [which follows from the static block theory], persons are not what we normally think them to be: self-conscious individuals who act and react with other things in space and time. Such individuals are, on the perduarantist view, just spatio-temporal parts or stages of persons, which are really four-dimensional objects. As such, persons are not self-conscious and have no intelligence, no volition, no emotions, no agency, no moral responsibility, no aesthetic appreciation, indeed, virtually none of the properties we normally associate with persons. Persons, on this view, are four-dimensional objects which are changeless, non-conscious entities. Well, I am not in danger of lapsing into fatalism because I reject the eternally static view of time for logical, scientific, and theological reasons. However, my case is that if the eternally static B-theory model of time is true, then how can we avoid fatalism? Our fates (end of each worm) have existed in their respective positions within the block without beginning and nothing will ever change their positions apart from dynamic time. Again (with near infinite degrees of respect), I highly disagree. I think Dr. Craig is hesitant to grant my argument because he thinks Molinism will become vulnerable to attack. However, there are no causal strings attached on a middle knowledge/dynamic time view. On the other hand, there are strings attached on an eternal static B-block view. These models are not analogous. I agree with Dr. Craig’s point regarding God’s omniscient middle knowledge and human free actions occurring in dynamic time; however, my point is that these are not “choices” at all if static eternalism is true. The structure of the block is outside of personal control whether we feel like it is or not. Persons would have no choice in the matter. How “can” we do anything at all on the eternal and static block theory model? Even if substance dualism were fused into the static and unchanging physical block, it would be akin to Han Solo being frozen in carbonite; a soul in a frozen block unable to move or change anything. Now imagine if Han Solo’s carbonite state existed without beginning and there were no agents — or anything else — operating in dynamic time outside of Han Solo’s carbonite state. Would Han Solo ever be freed from his frozen state? No. Apart from dynamic time things do not happen; therefore, if Han Solo existed in his frozen carbonite state without beginning and nothing happens, then Han Solo has no hope. Similarly, on a B-theory of time, although we cannot change the future, we can act in such a way that if we were to act in that way, the future would be different. Again, my question is this: how “can” we do anything on an eternally static model? If eternalism is true, “when the time comes” makes no sense. The “time” has always been there in a static and unchanging state from past eternity. With all due respect, I feel like Dr. Craig has got one foot in the block and another in dynamic time. How “could” we do anything if the fixed and frozen worm is eternally static? 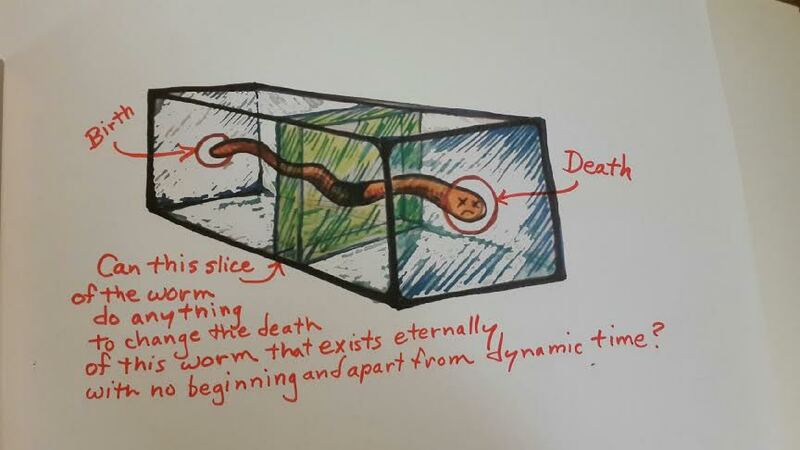 Moreover, how could a slice in the middle of an eternally static worm do anything to change the position the end of the worm eternally rests in apart from dynamic time? It seems right to say that we could have a different space-time block, but I do not see how this would be up to us. 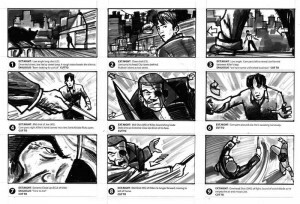 Think about this from the perspective of a storyboard. 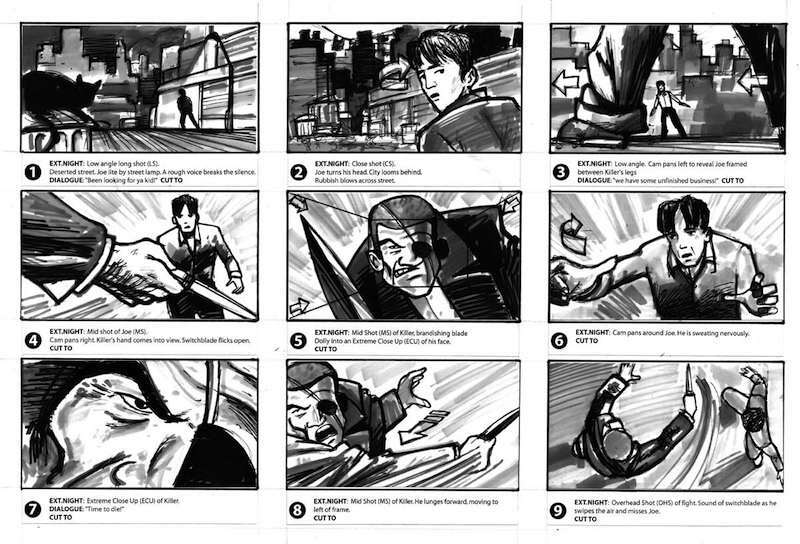 An artist can sketch out a story and let the frames conjunctively represent the space time block, yet each individual frame is stuck and cannot be different. Sure, the artist could have drawn a different story with different events, but even still each of those individual frames are set and it does not make any sense to say that each frame had any choice in the matter of what they were going to do. It is fair to say the block is not logically necessary (we can imagine it being different), and the decisions of these space-time worms could have been different, but it seems these so-called “decisions” were caused by God in the same sense that an animator causes the decisions of his animation. This is the epitome of theological determinism and I have argued this idea is logically incoherent. 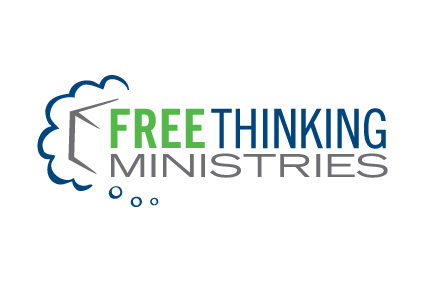 Even if God made a B-block to mimic what would have happened with libertarian free will under an A-theory, in a B-block that would be merely an illusory clone of libertarian free will that we experience psychologically – not the real thing! On Molinism Dr. Craig is right as there are no strings attached and there is a genuine ability to choose otherwise; however, on the eternal static block theory, nothing happens or changes. The way things are is the way things are and it will never change apart from dynamic time. There is no ability to do otherwise or to make a genuine choice at all. Now, if a change does occur, then this block is no longer static. I have the utmost respect for Dr. Craig. It is out of this respect I am offering this response. The reason I continue to make this case is because I am fighting to support Dr. Craig. If my position is correct, then the Kalam Cosmological Argument is strengthened as the number one objection to the Kalam is to simply reject the A-theory of time and opt for the B-theory. 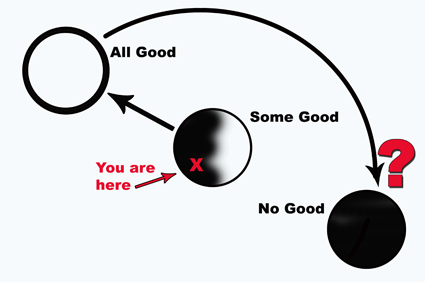 However, if my argument passes, then libertarian free will is impossible on the eternally static B-theory model. It follows that the adherent of the static view of time ultimately affirms they do not possess knowledge because if free will does not exist, then free thinking does not exist. If free thinking does not exist, then rationality and knowledge go down the drain. Dr. Craig is in a win/win position here. If he is right and I am wrong, then he wins the argument. However, if I am right and Dr. Craig is wrong on this issue, then the number one objection to his Kalam Cosmological Argument is obliterated. Thus, Dr. Craig still wins! *A special thanks to my fellow RF chapter director, Steve Williams, for thinking this through with me and helping me formulate the defense of my argument.